Chapter 8 of the Traffic signs Manual ( Traffic Safety Measures & Signs for Road Works & Temporary Situations ) was issued by the Department of Transport. It provides guidelines for companies operating on public highways on a range of issues including what conspicuous markings are required on Vehicles that stop for work purposes or inspection purposes on all public highways. Who does Chpater 8 affect? It affects any operator of large or small vehicles from HGV's to road mainenance trucks, small vans and cars that intentionally stop for work or inspection purposes on high speed roads. Are there different requirements for different types of vehicles? While all vehicles MUST be marked up, there are varying requirements. 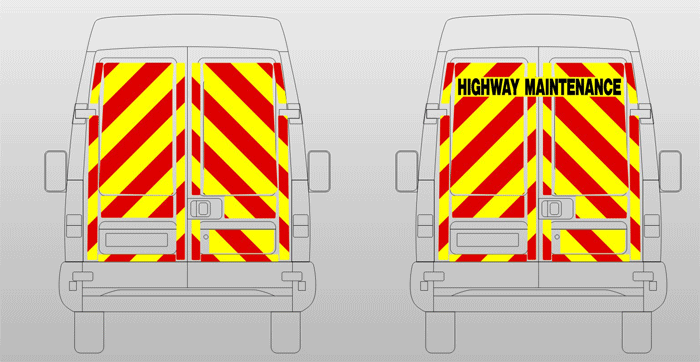 Four marking options exist, but it is generally accepted that high visibility film markings maximise the benefits associated with being seen. In addition, Maintenaince vehicles need to have a Highways Maintenance or Motorway Maintenance legend when they are working on motorways. These have to be of a certain size to comply with Chapter 8 Legislation. Also, in temporary traffic management situations, inspection, supervisory, maintenance and management vehicles require a Highway Maintenance sign that must be applied to the rear of the vehicle. Where do the markings need to be? 2. A solid block of flourescent orange-red retro-reflective material. The markings should cover as much of the rear facing portion of the vehicle as possible without obscuring the windows, the vehicle's lighting or it's registration plates. Red retro-reflective tape should also be applied to all rear facing edges of doors, rails or equipment lockers.